Back in 2015, when the Reading to Know Classics Book Club was up and running, the group read Christy, by Catherine Marshall. I did not manage to read it at that time because I couldn't seem to locate a copy. It was all very ridiculous, really, but eventually I decided to buy mass market paperback (like the one you see pictured here) in order to read it. I might be delayed in my reading goals by one year but I'm delighted to say that I finally did get around to reading it and that I loved it very much. For those of you who are unaware of the story line, Catherine Marshall wrote a fictionalized tale of a young school teacher who travels to Cutter Gap, Tennessee in 1912 to teach in a mission schoolhouse. The character of the teacher, Christy Huddleston, is based on Marshall's mother, Leonora Whitaker. Marshall said of this novel that it's about 75% historical fact with some fun fiction sprinkled around to make the story line a bit more interesting. Much of what the character of Christy experiences in this book are things which were experienced by Marshall's mother. Several characters in this book were based on people that Leonora Whitacker personally knew. In the story of Christy we are introduced to a backwoods people who are steeped in tradition, folklore and a proud history. They are a self sufficient lot who aren't sure about the work Christy and others who work at the mission have come to do. Christy herself comes from an affluent family and arrives unprepared for the harsh realities of the mountain folks. The smells and lack of hygiene, for one thing, prove a shock to her system. Her initial reaction to the mission life was to flee and return home and she might very well have done so without the loving intervention of one Miss Alice, a woman who challenged Christy to determine what her true motivation were for taking the position in the first place. In the end, Christy decides to muddle through. Ultimately, she does manage to bring small changes to the mountain people but, more importantly, she herself is changed. This is a very endearing and memorable story and is highly engaging, I read through it relatively quickly, wavering between wanting to fly through the story and wanting to linger awhile. At the conclusion, I felt like taking a reading break before picking up anything else. Some books are just hard to move quickly past and this was one of them. I loved Marshall's slow pace in the telling of her story. Even though I was anxious to find out how the story concluded, I enjoyed having to spend time getting to know the people that she was writing about. Characters and their backstories are unraveled and explained slowly enough that you come to appreciate their individuality. "In both the woman and her home there was an effortless beauty, never a straining for effect, a harmony that seemed to come from having one's roots drawn in the place where the roots were meant to be. There was something else I had noticed too: an initial acceptance of herself as she was and so of other people with their foibles. And so she did as little scolding or criticizing of others for their foolish behavior or their sings as anyone I had ever known. It was not that she was willing to compromise with wrongdoing or poverty or ignorance, just that she was a long step ahead of waiting emotional energy on fretting. And she never put pressure on the rest o us to accept her opinions. The secret of her calm seemed to be that she was not trying to prove anything. She was - that was all. And her stance toward life seemed to say: God is - and that is enough." I think all I want to say to that is that, if when I die, people say the above of me then that'll be alright. 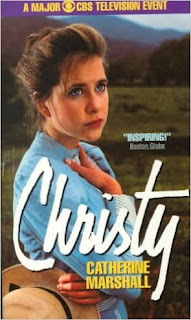 Although I was a bit late to the Christy party, I am very glad to have read this book. Highly recommended. So glad you were able to get to it! I much enjoyed rereading it last year. I'm so glad you got a copy of Christy in your hands. How exciting!